Oh. My. Goodness. Whether you’ve canned before or not, this is a “must do” this summer. The scent of Honeysuckle spurs magical childhood memories of summers here in the South where honeysuckles are found at every turn. Whether you’re outside doing chores or sitting back relaxing, Honeysuckle fragrance has a wonderful way of gently permeating the air and just plain making a person happy. 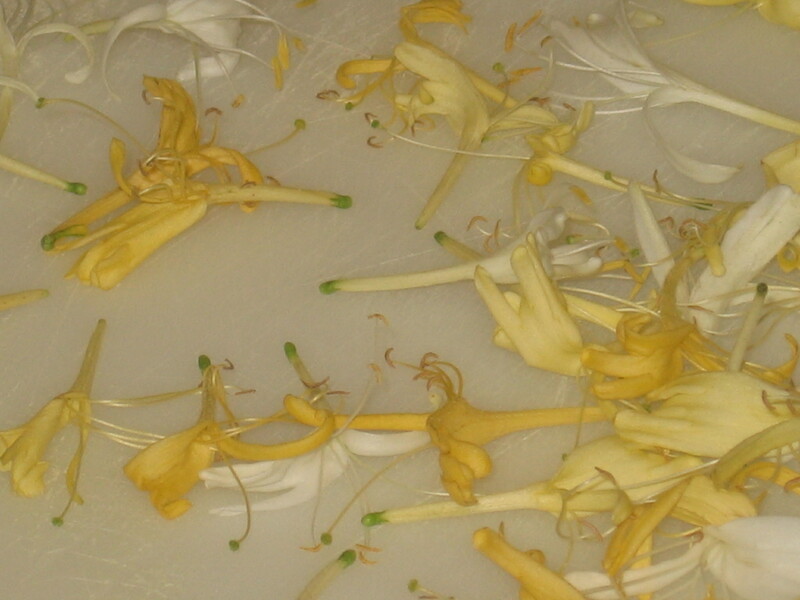 After many ripped flowers, my 5 year old has finally mastered the extraction technique and formed a real appreciation for Honeysuckle “honey” straight from the flower. I’m guessing that no matter your age, you probably loved and indulged in the “honey” too. Hopefully you still do. 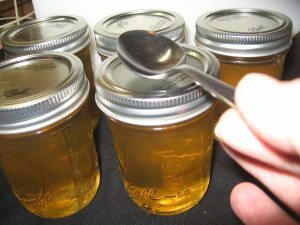 With a mind to try and trap some of this delight in a jar, I did a ton of searching for a Honeysuckle Jelly recipe that made sense to me and this is the one I settled on, with a few tweaks. On the next batch I believe I’ll work on the amount of sugar used, but here is the first version that I still highly recommend. Spread it on a biscuit or serve it as a unique summer party hors d’oeuvre with a dab of cream cheese on a fancy cracker like you would with Hot Pepper Jelly. It tastes and smells just like honeysuckle flowers and is bound to get the party conversation started! My recipe said to wash them, but I couldn’t wrap my mind around that so I didn’t do it. Mine were in no danger of having been sprayed with anything, or strewn with debris from passing cars. Make your own call on washing, depending on where you harvest from. 3) Make a Honeysuckle Infusion by bringing 2 cups of water to a boil and pouring it into the mason jar containing the 2 cups of prepared flowers. Cap it tightly and let this sit a minimum of 4 hours or overnight if possible. If you have to separate your time for this recipe, let the jar of infusion cool and store it in the refrigerator for up to 2 days. You can strain it beforehand or afterward. We had one of our goats kid right in the middle of my jelly making and I left mine in the fridge, unstrained, from Saturday afternoon until Tuesday evening. 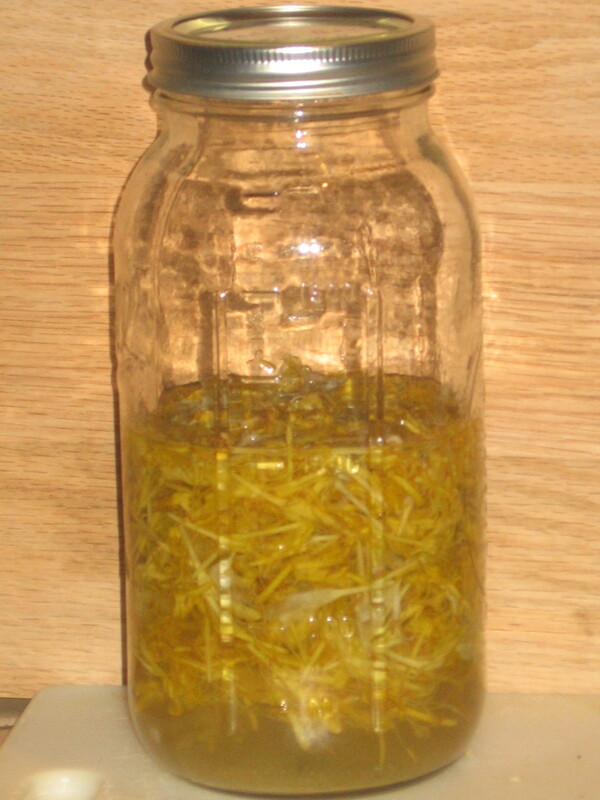 The infusion turned to a cloudier yellow/green, but reverted to a beautiful golden clear once it was cooked. 5) Add 1/4 Cup of lemon juice and 4 Cups of sugar to the pot containing the infusion. Turn heat to medium high. Stirring constantly, bring the mixture to a boil that won’t stir down. 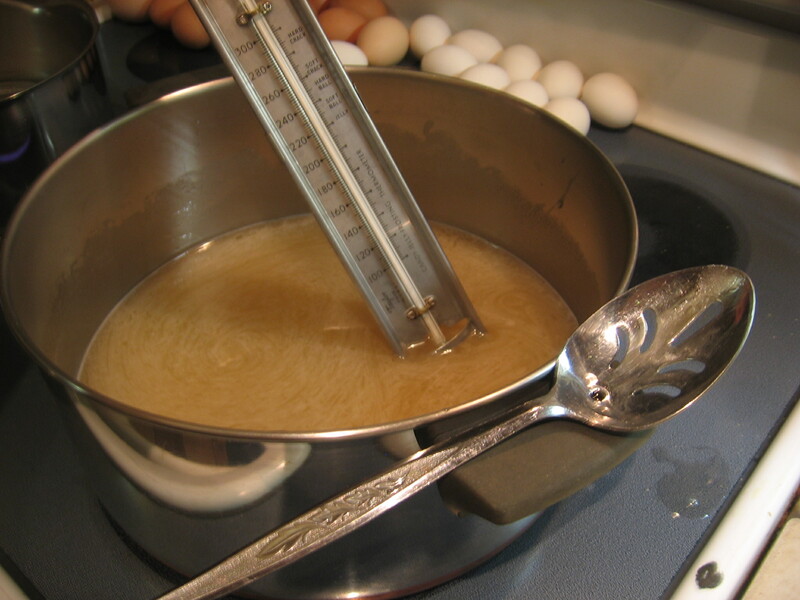 If you have a Candy Thermometer , bring it to “Jelly” stage or 220 degrees. 6) Add ONE 3 oz. package of Liquid Fruit Pectin, 2 Pack, 6 Fl Oz (this Amazon link is for a 2 pack box, please do not be confused by the link description). Boil for 2 minutes. You want to have the large saucepan mentioned so that the mixture doesn’t boil over the top of your pot in this step. 7) Ladle jelly into the hot, sterilized jars leaving approximately 1/2 inch head space. Screw on sterilized lids until they are “finger tight”. Use tongs to retrieve the hot jars and lids from their sterilization bath. Some recipes say to process jars of jelly in a Water-Bath Canner for 5 minutes, but I always do what my mother and grandmother did and just turn them upside down for 5 or 10 minutes, then right them to cool and they seal just fine. If botulism were a concern because of the acidity level, I would go for the pressure canner, but for jellies like this it’s not necessary. The water bath canner for only 5 minutes doesn’t get hot enough to address that anyway. 8) Place the jars, turned upright, away from excessive heat or drafts and allow to cool for 24 hours. You’ll hear them “Pop” when they seal and it’s fun to count them down. Once fully cooled, you can test to make sure they are properly sealed either by pressing on the tops to make sure they don’t make any sound or have any movement in the lid, or by bouncing a small spoon on each lid. If they are sealed, the spoon will bounce easily and make a nice “ping”. If they aren’t sealed, the sound will be dull and the spoon won’t have a good bounce. Jars that don’t seal can be kept in the refrigerator and used first. – 1 package liquid pectin – ONE 3OZ PACKAGE. 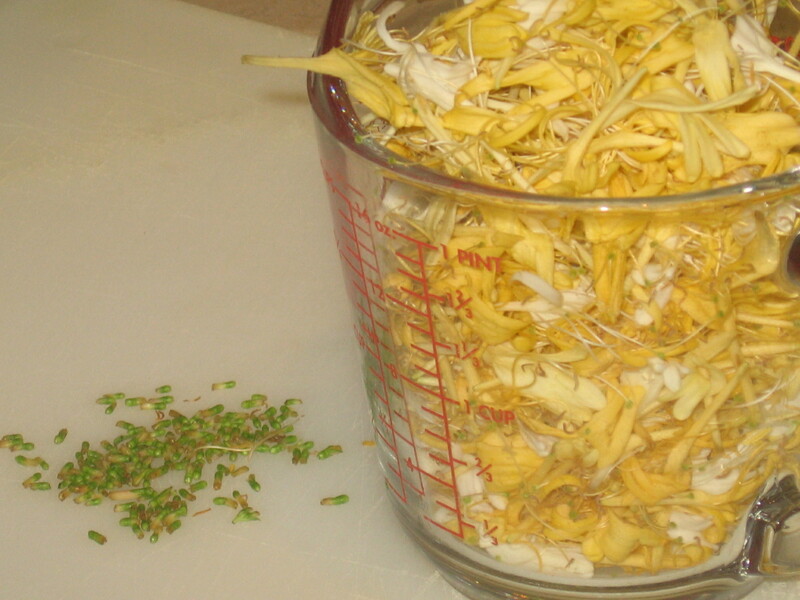 Pick green tips from flowers and discard. 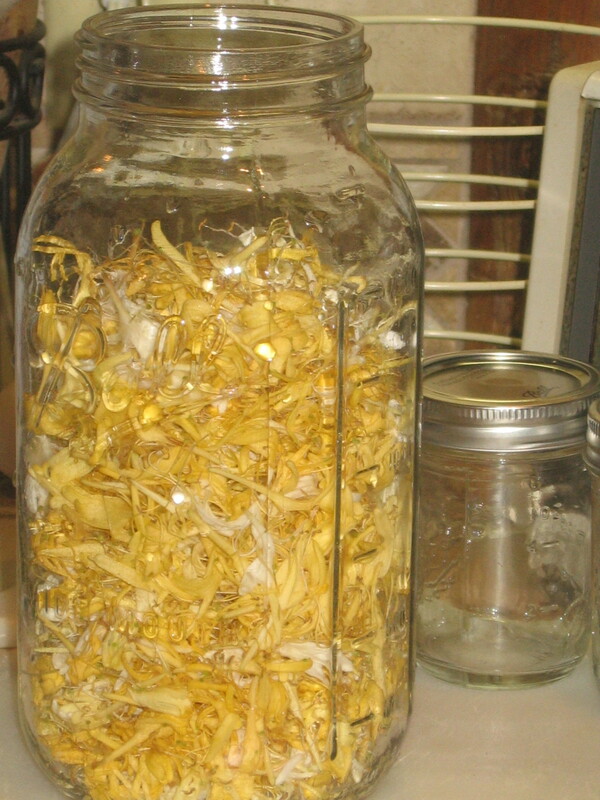 Make an infusion by placing flowers and boiling water in a half gallon mason jar and capping tightly. Let sit for at least 4 hours or let cool and refrigerate for up to 2 days. Add the pectin and boil for 2 minutes. 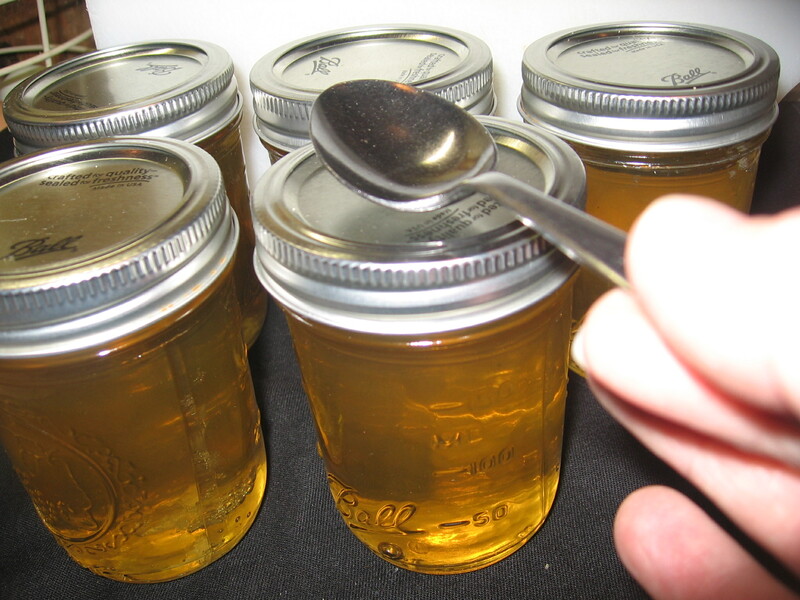 Ladle into hot, sterilized jars and cap with sterilized 2 piece canning lids. Place jars in a water bath canner for 5 minutes or turn upside down on a towel for 5-10 minutes before righting. Place jars upright on a towel, away from excessive heat or drafts and allow to cool for 24 hours. Test jars for proper sealing. Excellent point to be noted on the powdered vs. liquid pectin, Amie! If using a powdered pectin…sugar is put in after boiling. Read package instructions. (Liquid pectin is added after tea infusion, lemon juice, and sugar is boiled.) If you used powdered same as liquid…that could be your issue. Plus pection to liquid to sugar ratio can change from recipe to recipe. Though, I remember powder pectin has instruction for liquid quantity. Good morning. 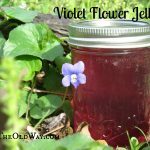 I’ve often made rose petal jelly, and thought about Honeysuckle jelly and found your recipe. 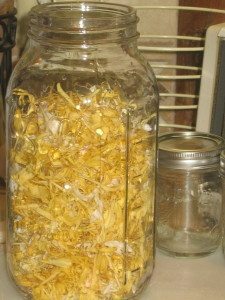 When I’ve made rose petal for the infusion I’ve used apple juice or white grape juice instead of water. I’d also was hoping for a recipe using honey or some honey with the honeysuckle! Have you tried it with anything besides water? I don’t know if the flowers are strong enough in flavor that one wouldn’t need the juice, or the juice would over-power. But just thought I’d make a remark. And back when the woman was asking about liquid pectin you should use the word certo. Maybe she might realize she has seen it. hello!….made this and was wondering…how long will it take for the liquid to “firm up” into a jelly/jam like state??? Can I freeze the infusion? I haven’t used any other honeysuckle except the traditional Lonicera Japonica (Japanese Honeysuckle) because I’m familiar with it and know its nectar to be edible. For any others, it really depends on what the variety is. I would try to identify it first and then research if that particular variety is edible or not. 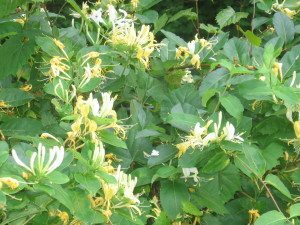 On your identification, you can start with the following that are known to have edible parts and see if yours is among those: Lonicera affinis, Lonicera angustifolia, Lonicera caprifolium, Lonicera chrysantha, Lonicera ciliosa, Lonicera hispidula, Lonicera involucrata, Lonicera kamtchatica, Lonicera periclymenum, Lonicera utahensis, Lonicera villosa, Lonicera villosa solonis. 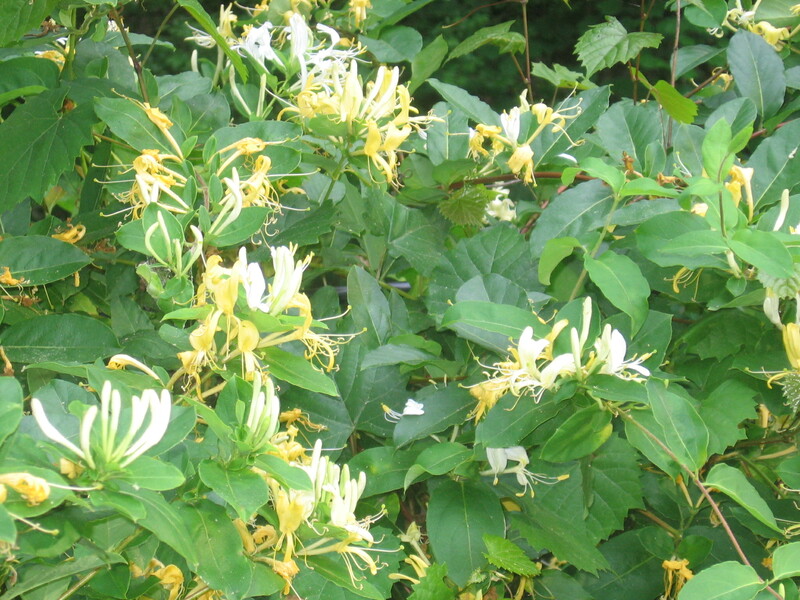 Also, keep in mind, once you move away from the Japanese Honeysuckle, you will find varying opinions on whether the other varieties listed above are safe or not. I’m afraid I’m no help there because I haven’t worked with any of them. A really common pink/coral variety is Lonicera sempervirens but I don’t believe that one is safe to eat. You can google it and see if it looks like yours. 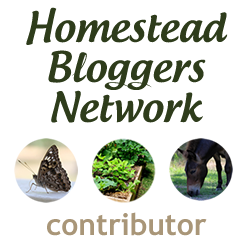 We have several pink honeysuckle trees on our property, will they be okay to try in this? Yay! That is awesome news!! I’m so glad you came back to let us know, this is great information! Do you mind if I go back in and put an edit at the bottom of this post with your proportions you found with Pomona’s in case others want to do it this way too? Actually to my surprise it turned out amazing. I wasn’t going into this with too much expectation. I used 2t of pectin and 2t of calcium water and 2 cups of sugar. Which is what was on the package insert for this brand. 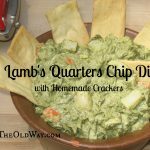 Thank you for the great recipe. I would only use what the recipe calls for. If I’m not mistaken the kind you mentioned is powered. That will not work usually powdered is added at the beginning of cook time. I substituted powder for liquid one time and it didn’t turn out. I don’t recommend it. Hmmm. I’m not sure. I’m not familiar with Pomona’s. I did google it though and it looks like it’s geared toward producing lower sugar jellies? My best suggestion would be to start with one packet and process as usual. Before you get start making it though, pre-freeze a desert plate in your freezer, then once the jelly is ready, but before you jar it, put a dab of jelly on the cold plate and you’ll be able to see if it is going to set or remain liquid. If it doesn’t set, bring it back to a boil and add a second pack. I have had to do that in the past when jelly doesn’t set for some reason. It’s a little more work, but doing it that way is way less work than putting it in the jars and THEN finding out it’s still in a liquid state! Haha! The other thing you could do is to see if there is a recipe in Pomona’s instructions that has a similar quantity of liquid and go by that one. I will also ask this on my facebook page and see if anyone has experience working with Pomona’s. If you’re not planning/needing to make it immediately, let’s give it a day or two to see what others know about it. What if I’m using Pomona’s Universal Pectin? How much of that do I use?? Thank you. No problem glad I could help. I knew it was going to be a small batch, and used what I always use which is just one pouch. My property is over 100 acres and about 30 of it is blackberries I make large quantities of jam, jelly, and syrup. Have been for a while now. The more I make in one batch the more pectin ? 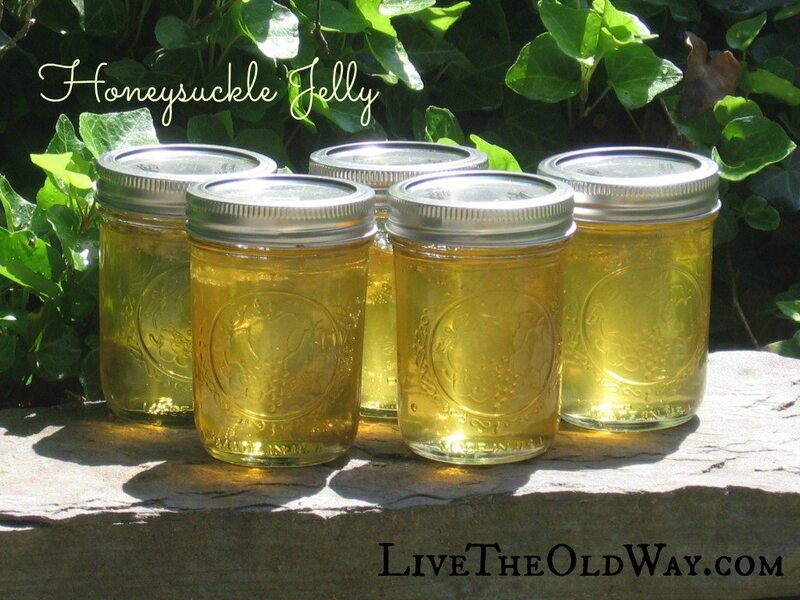 This honeysuckle Jelly oh my….. I made some of it and it’s great. Thank you for the recipe. I’ve printed it off, it’s in my heirloom cookbook. Thank you again…. ? Hey Kimberly, thank you for the comment. The recipe is indeed using one 3oz package of pectin. At first I wasn’t sure where you were finding the instructions to use 6oz. but I think the confusion is in the Amazon link for where to purchase a 2 pack box of pectin. The link description as provided by Amazon reads “Liquid Pectin, 2 Pack, 6oz.”, since it comes in a 2 pouch box. I may be able to change the link tag, if so, I will do that. What seems clear to me doesn’t mean it will be clear to everyone else, so thanks for the catch! For many years I’ve made various jams and jellies especially when my raspberries and blackberries come in season. As much as I’ve made and the pectin all have called for, I’ve never seen nor bought a 6oz package of liquid pectin. They have only and always came in 3oz. Some recipes call for either 3oz or 6oz. If it calls for 6oz that means you use 2 packages. Because they do not come in 6oz, sorry. But, the use of more or less will mess up any preserve…. Hey Joe! It really is crazy good! I did a bunch of recipe comparing and pretty much all of them have these same ingredients but different methods of extracting the honeysuckle flavor. 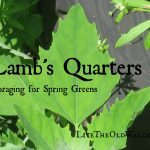 The method I decided on was based on the way I make infusions of other plants and herbs, and proportions from a “Birds and Blooms” magazine article from 1997. I’m glad you pointed out the post name, I don’t remember that website but did look at tons of them over the course of 5 or 6 days, though. Here I was so proud of myself for coming up with a catchy name, but maybe that’s why it came to me so easily, I had already READ it! Haha! I just visited their site and even though the preparation is different, I still think I’ll go back and change my post name just so they don’t think I’m trying to rip them off. Thanks for the heads up! Hey Jennifer! I’m sorry it took me so long to respond to this, we’ve been so busy. I hope you still see it! The sugar seemed like a lot to me also, but was the same in just about every recipe that I found for flower jellies so I figured that was at least the place to start. In my next batch, I’m going to reduce the sugar to 3 cups. Since it has pectin added, and is not dependent on a fruit to sugar ratio to create a gelling process, I think it should work. Worst case, if it doesn’t set, I’ll put it back in the pot, add the fourth cup of sugar and reheat it! Haha! I have a ton of honey suckle around my house right now and I love the way it smells. I would never have thought about making it into jelly, but I bet my kids would love to try it! Can you tell me what you would do differently with the sugar? That seems like a lot of sugar, and I try not to use sugar at all. I wonder if I could try using coconut sugar. Anyway, thanks for the great post! Pinned! Just got off the phone with her and like most things she never used a recipe ( old school) But she said she just boiled the cobs and used the water off them and made it like you would any other jelly…. Over my head but you should give it a try, I used to really like it and looks in color just like the finished honeysuckle jars in your pics. No credits needed. My mom used to make corn cobb jelly that was pretty good and was a good use of leftover cobbs. I’ll try and get the recipe from her to give to you.